1. Place the grated beetroot into a bowl. Heat the oil in a small pan, and add the garlic and caraway seeds to the oil. Before the garlic colours, tip in the orange zest and juice and cook for 5 minutes or until the orange has reduced to a syrup consistency. 2. Mix in the vinegar and the extra virgin olive oil. Drizzle over the beetroot, season with salt and pepper and mix together thoroughly. Next mix together the horseradish dressing ingredients in a bowl, whisking well to combine. 3. Add a little water so that it is the consistency of double cream. Set to one side for the flavours to develop. 4. Prepare the cucumber and radishes by slicing thinly into rounds then cutting across the rounds into thin matchsticks. 5. To assemble, spread the watercress across the base of a serving platter. Sprinkle with the dressed beetroot. 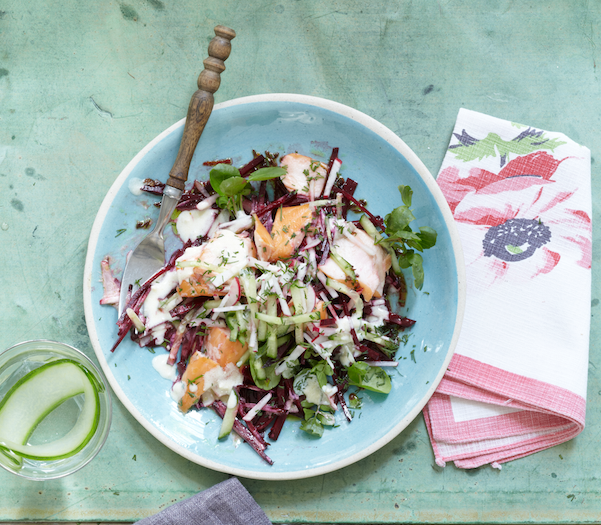 Gently pull the salmon into large chunks and place on top of the beetroot. Drizzle with the horseradish dressing and sprinkle the cucumber and radishes over the top, finishing with the chopped dill. The autumn 2015 edition of the Liz Earle Wellbeing magazine is available now from lizearlewellbeing.com. Subscribe to the digital edition for £10 or the printed edition for £19.96 per year for 4 issues, p+p free.